Vale House Kitchen is a bespoke country skills and cookery school situated in the village of Timsbury, 8 miles southwest of Bath. We offer a wide range of cookery and baking courses as well as a unique opportunity to acquire or hone your fishing, shooting, foraging, brewing and butchery skills. Our courses cater to all levels from beginner to expert and are taught by the very best of the South West’s culinary professionals, including Tim Maddams, Kieran Lenihan and Vivien Lloyd. We limit numbers to 8-10 participants per class to ensure an intimate, hands-on and inspiring experience. Vale House Kitchen was conceived by Bod and Annie Griffiths in early 2011. Bod has been passionate about shooting and fishing since childhood, and spent his school holidays exploring the West Country. 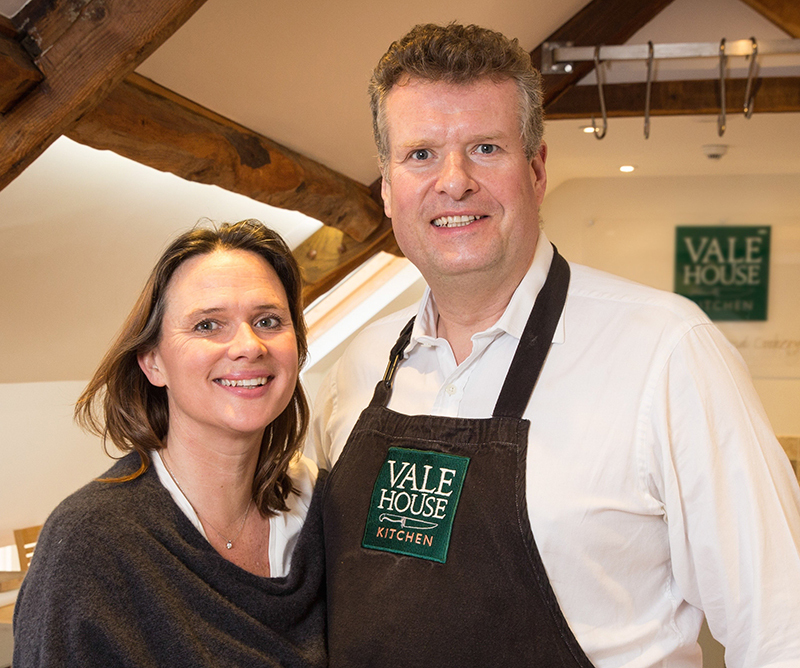 After working in London for 20 years and moving to Vale House, Bod wanted to find a way to combine his passion for people and business with his love of the countryside. On returning from a fishing trip and enjoying a meal where everything on the plate was either from the local river or from their own veg garden, Bod and Annie knew they had found the ‘from field to fork’ philosophy that would soon evolve into Vale House Kitchen. Plans were drawn up for the conversion of a stone outbuilding into a state-of-the-art cookery school, which opened in Summer 2013. • Our unique mix of country skills and cookery courses. To enhance your passion for food, you can learn how to find, catch, shoot, prepare, cook and present it – all in one place. • Award-winning professional tutors you can really learn from. Our class-sizes are small and focus primarily on practical, one-to-one direction. • State-of-the art kitchen workstations and demonstration area, fully equipped by Smeg, with a hand-made beech finish. • Access to Shellards Shoot, Cameley Lakes and other local amenities to enhance your Vale House Kitchen experience. • Our beautiful rural setting has easy access to Bath, Bristol and beyond so you can enjoy a weekend city break or do some sight-seeing while you are with us. • Cook with the finest locally sourced ingredients. We care about the providence of all foods in our kitchens. Stream Farm in Bridgewater is providing our lamb, chicken, beef and trout, and any vegetables we don’t grow ourselves will come from the Community Farm in Chew or Farringtons Farm Shop in Farrington Guerney. • Because we want you to learn, laugh and love local food as much as we do. Vale House Kitchen is a bespoke country skills and cookery school situated in the village of Timsbury 8 miles southwest of Bath. We offer all the traditional courses you would expect from a cookery school but have the added dimension of teaching skills such as fishing, shooting, foraging, brewing and butchery.